Med Group can refer you to three (3) EHR Systems you can choose from that will have a free interface into Med Group�s Healthpac billing system. Once set up and operating , client will be eligible for Meaningful Use Grants from the U. S. Government of up to $44,000 per provider ($64,000 if you meet the size test as a Medicaid provider). 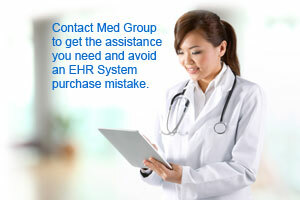 No more concerns about evaluating the sales pitches of EHR sales representatives with inferior and overpriced products.